Infrared photography has been popular since the 1930s when Kodak, Ilford, Agfa, and other companies first began to manufacture black and white film that was sensitive to infrared light. 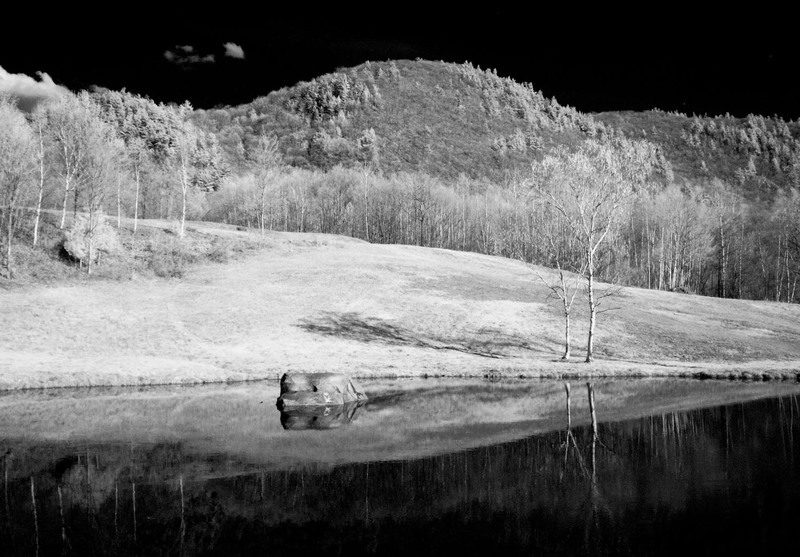 When used with filters which block some or all of the visible light, infrared film produces stark and dramatic images with bright foliage and dark skies, although most other parts of scenes appear much as they do in normal black and white photos. The snowy white foliage is a result of the strong reflection of infrared light by healthy leaves -- few abundant natural substances reflect as much infrared light as leaves. Skies appear dark in infrared photos because infrared wavelengths are not scattered by the atmosphere. Normally the sky looks bright blue to us because light at the blue end of the spectrum causes molecules in the atmosphere to radiate bluish light in all directions. Wavelengths at the red end of the spectrum cause much less of this Rayleigh scattering, so clear skies are dark in photos made with infrared light. These two effects are not fake, or unnatural, they are just effects that the unaided human eye cannot see. The sensors in digital cameras, both CCD and CMOS, are sensitive to infrared light, which would "ruin" normal photographs. So almost all digital cameras have a filter in front of the sensor which blocks most infrared light. By removing this filter and replacing it with one that blocks visible light, we can create the same stark effects that infrared film photographers have exploited for artistic and scientific purposes for 80 years. The Public Lab infrared camera tool includes one camera that has been modified in this way so that infrared information can be used to create false color infrared or normalized difference vegetation index (NDVI) images. The photos direct from these cameras usually look pink, but if a custom white balance is done first, or the photo is desaturated or white balanced afterwards (e.g., in Photoshop), they look very much like the classic infrared black and white film photos. The filter which blocks visible light in the Public Lab infrared camera is a piece of exposed, developed, color print film. After a year of using one of these cameras, I opened it up a week ago and replaced the piece of film with a piece of Wratten 87 polyester filter that I bought at B&H Photo. Although there was no obvious improvement in focus or sharpness, the contrast and tonal range seems more dramatic with the new filter. But after adjusting the contrast and black level, it is hard to distinguish photos taken with the old and new filter (all of my photos in this note have had their levels adjusted for dramatic effect). For learning about plant health, interpreting results from the new filter will probably be easier because it passes no visible light -- transmission is only at wavelengths greater than 730 nm. The old film filter leaks some visible light, including wavelengths that plants absorb for photosynthesis. If you hold the old film filter up to a light you can see the bulb, but the Wratten filter is completely opaque to the eye unless you look through it directly at the sun (a very bad thing to do). 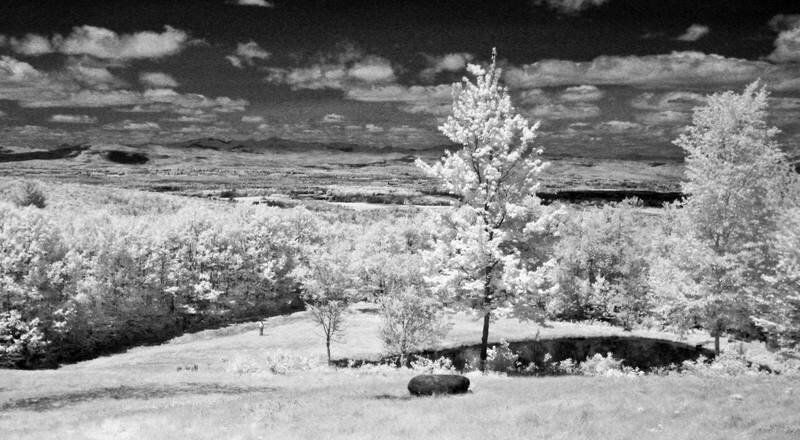 Infrared photo taken with a Canon A495 and Wratten 87 filter on April 28, 2013. Pines and hemlocks on the distant hill are brighter than the deciduous trees which have not yet leafed out. Grayscale NDVI image of the scene above. NDVI images are not infrared photographs. They are images derived from photographs by computing a value for each pixel using data from an infrared channel of a photograph and a visible light channel. The lighter the tone, the higher the value, and the more photosynthesis is probably happening there. I have been having fun experimenting with black and white infrared images, so I was surprised to receive in the mail this week seven lantern slides of infrared photographs. These belonged to my father and had been sitting around my brother's house for more than a decade. 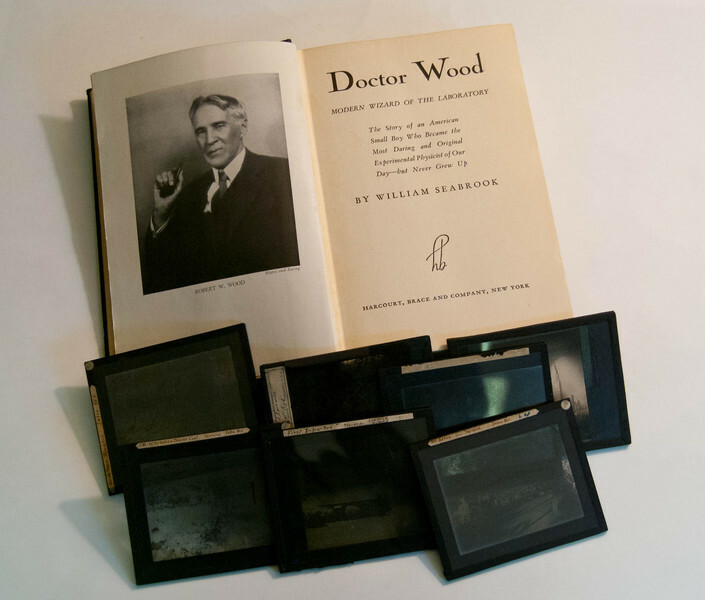 I had no recollection of these 3 x 4 inch glass projection slides, but I immediately recognized one of the images as attributable to R. W. Wood, who is known to have published, in 1910, the very first infrared photographs. Wood overlapped by a few years with my father in the physics department at Johns Hopkins University, and these slides probably came into Dad's possession during or after that time. Some have descriptions written on them in what I assume is Wood's hand. Seven lantern slides that came into my possession this week and the 1941 biography of the man who took the seven infrared photos. In the 19th century, photographic emulsions were sensitive mostly to blue and ultraviolet light. Emulsions sensitive to infrared light had been developed for spectroscopy, but Wood was the first person to put such a photographic plate in a camera and take a photo. He wrote that an exposure time of about 10 minutes was required to make these photos, which he described in a 1910 lecture which was published in The Photographic Journal with the title "Photography with Invisible Rays". Most of the images in the lantern slides are from Italy, where Wood spent part of his sabbatical in 1910. One is labeled "Mt Aetna from Taormina. Infra-Red." 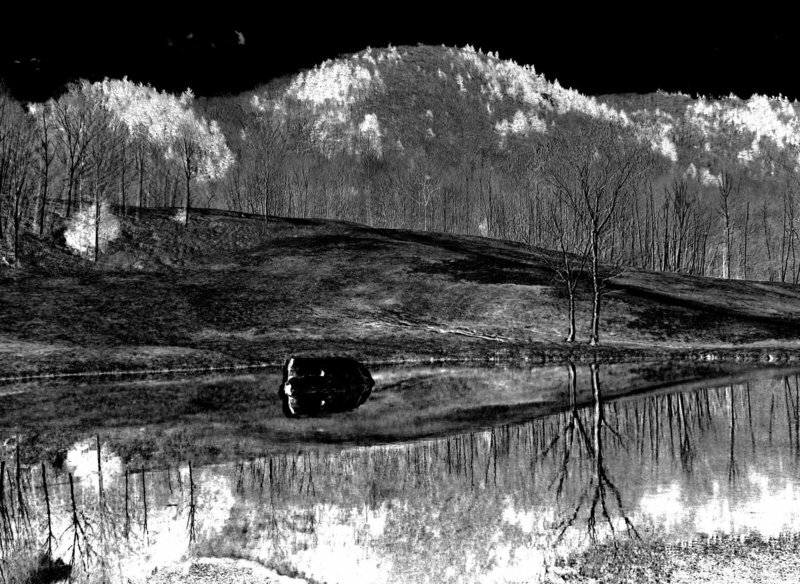 Another is labeled "First Infra-Red Photograph. R.W.Wood Home." This is apparently R. W. Wood's lantern slide of his own photo of his back yard, which was the first infrared photograph ever taken. I have not been able to find any reference to this photo, so its significance might be undocumented. It is not the original, which was probably a larger glass plate, and was a negative. But holy mackerel, it just happened to show up in my mailbox this week. Mount Aetna. 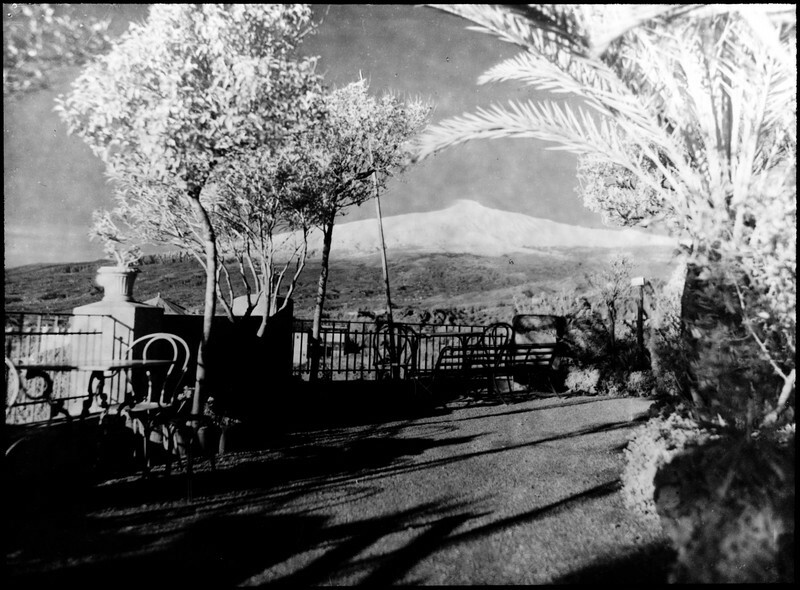 An infrared photograph taken by R. W. Wood in 1910 in Sicily. 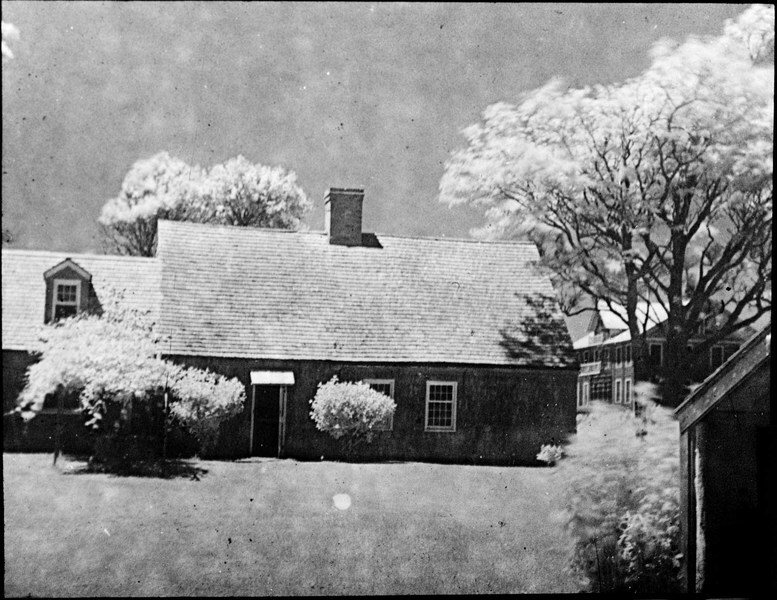 The putative first infrared photograph ever taken. Made by R. W. Wood in 1910 in his backyard. The dazzling effect of the glowing white foliage is still known as the Wood effect. I would be remiss if I failed to mention that R. W. Wood also made photographs with a camera lofted by a kite and triggered by gunpowder. That's amazing that you have those plates! You said it was probably not the original, but i wonder who else has a copy, or knows of its significance? Chris, what a thoughtful and informative piece. Delightful that you also had the R. W. Wood, infrared photographs show up in your mail box. Brother Will, who sent me the lantern slides, asked a good question today: What is a lantern slide? I guess I should have assumed that many folks born after Kodachrome came to dominate the color slide business in the 1940s would have no idea that people have been projecting still images onto walls and screens for three and a half centuries. The earliest devices, known as Magic Lanterns, used transparent paintings or drawings, and usually relied on candles or oil lamps for illumination. It took only ten years after photography was invented in 1839 for a couple of professional daguerreotypists in Philadelphia to make a glass plate negative of a glass plate negative and produce a transparent positive image which could be used as a Magic Lantern slide. Although the primary use of lantern shows was entertainment, classroom educators quickly recognized their value, and disciplines like the history of art and architecture came to rely heavily on collections of lantern slides. The primary lecture halls in museums and academic institutions everywhere had lantern slide projectors which eventually used electric bulbs and accepted 3 x 4 inch or slightly larger slides. The lantern slides Will sent me are apparently typical. They consist of two thin glass plates sealed around the edges with black paper tape. There is nothing between the glass, although later versions could have sandwiched a film positive in there. In the standard process, one of the pieces of glass was a photographic plate, and was used in a camera to make a negative image of a negative image of the desired scene. The developed plate with a positive transparent image became half of the lantern slide with the emulsion protected on the inside. You could make these yourself, but many businesses would take any image you sent them and return a lantern slide. Commercially available sets of lantern slides (guess what one of the earliest uses was) were often hand colored. The modern Kodachrome process was announced in 1935. Kodak introduced a projector for 2 x 2 inch slide mounts in 1939. During the following decades certain academic disciplines suffered the same gnashing that is currently forcing many educators to abandon their vast color slide collections. Middlebury College announced this spring that slide projectors will no longer be available in most lecture rooms starting in 2014. I guess Paul Simon was prophetic.